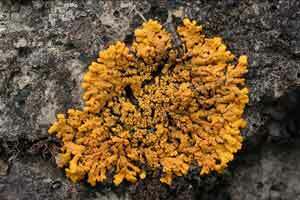 The 'elegant sunburst lichen', <em>Xanthoria elegans</em>, on rock. 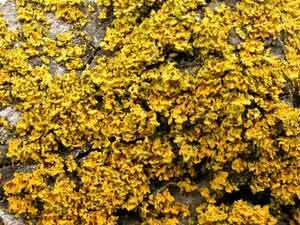 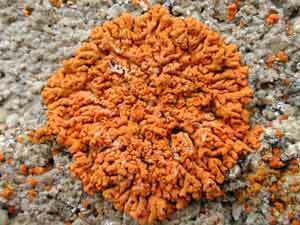 The Haisla and Hanaksiala in British Columbia used this lichen as a pigment for face paint. 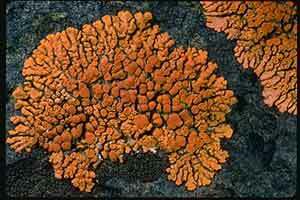 It is easy to confuse this lichen (common in western North America) with some of the lobate species of <em>Caloplaca</em>, especially <em>Caloplaca ignea</em>. 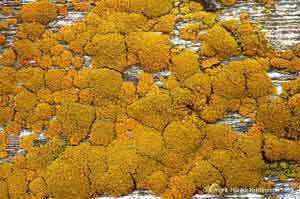 A quick test is to gently peel up the edge of a lobe; if it can be removed from the rock without falling apart, it's the <em>Xanthoria</em>.